There are a lot of things you can do with a $1 bill. You can purchase four gumballs at your local grocery store. You can tip your bartender. You can make a paper hat for a very small rodent. Or you can snag an order of Wendy’s fries in the the size of your choosing, which is probably the best option for you and your rodent. That's right, $1 fries at Wendy's. Friday only comes once a week, so the snarky people over at Wendy’s have decided to make every day fry-day. The spot’s crispy, skin-on fries will cost you just $1 at most locations across the United States for a limited time, starting on Monday, October 22. Check your local Wendy’s website to make sure they’re in on the deal, then set out to test just where your fry-threshold lies. 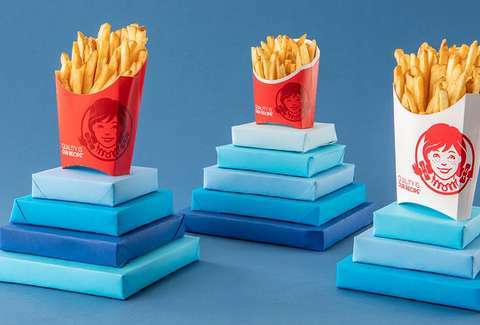 On any normal Monday, a large order of fries will set you back $2.89 at the fast food purveyor, so hit one of the 6,000 nationwide locations ASAP -- before the special runs out. And don't forget to grab a few extra packets of ketchup, or perhaps a whole lineup of dipping sauces to keep things interesting as you plow through your mountain of fries. Just keep in mind that the deal doesn't apply to combo meal orders. You better commit: all-fries or nothing.